Functions as an independent mediator and consultant to assist clients to resolve conflicts and solve complex issues. Designs and facilitates group processes. Provides planning and training services to improve collaborative relationships. Mediated resolution of a long standing dispute between two public education institutions that resulted in creation of a public/private venture to create new education programs in the community; assisted 13 community groups to discuss and reach consensus on what to do with a controversial park; guided two state agencies to work together to revise policies to develop mutually complementary goals and systems. Intervened in negotiations to resolve business management, employment, farm and special education disputes. Maintaining a positive customer satisfaction rating in over 95% of the cases. Led an Employee Owned Company to develop a strategic plan resulting in improving growth and profitability to rates that exceed industry standards; Led the Board of Directors of a regional Chamber of Commerce to create their first strategic plan in more than 10 years and to identify how they will use the plan to assess progress; Led a private non-profit organization to improve their High Performance Workplace ranking by guiding them to develop their plan and to use it as a tool for assigning responsibility and clarifying accountability. Facilitated an executive level group of Union and Corporate Officers to reach consensus upon and achieve their 13 implementation objectives to redesign and launch an internal operating system in 56 manufacturing, parts distribution and engineering locations in18 months. Designed and delivered customized training about understanding and managing conflict to over 500 executives and professional employees. Designed, implemented and refined administrative systems for eight Regional, Union and Corporate Joint Training Centers. Each Regional Center served 1,500 to 6,000 employees and their families by providing credit granting academic courses and personal enhancement sessions. 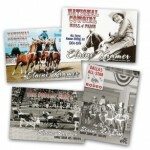 Designed and managed Elaine Kramer’s national campaign for induction into the Cowgirl Hall of Fame. Developed and engaged a nationwide network; produced public relations information including audio, video and print media; and, scheduled and supported public appearances. Elaine was inducted in October 2005. Reported to the Bureau Director to direct Wisconsin’s Displaced Worker Program. Managed an annual average budget of $5 million Federal and State funds. Developed the program’s administrative rule, policies and administrative systems. Managed competitive selection processes. Negotiated and managed sub-grants. Redesigned the state’s strategy for competing with other states to capture federal funds. Increased dollars earned in national competition from $300,000 per year to $3.1 million per year. Sustained growth for the remaining 4 years of employment with the state. Oversaw projects serving workers displaced from 55 separate businesses and met or exceeded federal standards for program performance and budget integrity each year. Worked directly with the Secretary of Labor during Democratic and Republic Administrations. Facilitated development of a synergistic relationship among legislators, cabinet level officials, department administrators, staff and public stakeholders culminating in a new strategy for serving the state’s workforce. Managed an average of $5 to $7 million in federal government funds to assist low-income youth and adults in 36 rural counties of Wisconsin. Served as Acting District Director during the last 9 months of operation of the state agency.